In the early morning of October 27, the Hubble Space Telescope targeted a field of galaxies not far from the Great Square in the constellation Pegasus. Contained in the field were star-forming galaxies up to 11 billion light-years away. 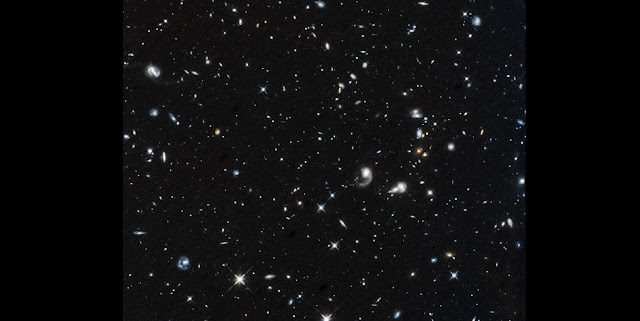 With the target in its sights, Hubble’s Wide Field Camera 3 recorded an image. It was the first picture captured by the telescope since it closed its eyes on the universe three weeks earlier, and it was the result of an entire team of engineers and experts working tirelessly to get the telescope exploring the cosmos once again. On the evening of Friday, October 5, the orbiting observatory had put itself into “safe mode” after one of its gyroscopes (or “gyros”) failed. Hubble stopped taking science observations, oriented its solar panels toward the Sun, and waited for further instructions from the ground. It was the beginning of a three-day holiday weekend when members of the spacecraft’s operations team started receiving text messages on their phone, alerting them that something was wrong with Hubble. In less than an hour, more than a dozen team members had gathered in the control room at Goddard to assess the situation. After unsuccessfully reviving the failed gyro, they activated a backup gyro on the spacecraft. However, the gyro soon began reporting impossibly high rotation rates — around 450 degrees per hour, when Hubble was actually turning less than a degree per hour. “This is something we’ve never seen before on any other gyros — rates this high,” said Dave Haskins, Hubble’s mission operations manager at Goddard. Hubble has six gyros aboard, and it typically uses three at a time to collect the most science. However, two of its six gyros had previously failed. This was Hubble’s final backup gyro. The operations team either had to figure out how to get it working, or turn to a previously developed and tested “one-gyro mode,” which is proven to work but would limit Hubble’s efficiency and how much of the sky the telescope could observe at a given time of the year — something both the operations team and astronomers want to avoid until there is no other choice. As they decided what to do next, team members stayed in the control center continuously to monitor the health and safety of the spacecraft. Because Hubble’s control center had switched to automated operations back in 2011, there were no longer people in place to monitor Hubble 24 hours a day. Meanwhile, during the holiday weekend, Hubble Project Manager Pat Crouse was busy recruiting a team of experts from Goddard and around the country to analyze the backup gyro’s unusual behavior and determine whether it could be corrected. This anomaly review board met for the first time that Tuesday, October 9, and contributed valuable insight throughout Hubble’s recovery. It took weeks of creative thinking, continuous tests and minor setbacks to solve the problem of the misbehaving gyro. Members of the operations team and of the review board suspected there might be some sort of obstruction in the gyro affecting its readings. Attempting to dislodge such a blockage, the team repeatedly tried switching the gyro between different operational modes and rotating the spacecraft by large amounts. In response, the extremely high rotation rates from the gyro gradually fell until they were close to normal. Encouraged but cautious, the team uploaded new software safeguards on Hubble to protect the telescope in case the gyro reports unduly high rates again, and then sent the telescope through some practice maneuvers to simulate real science observations. They kept a close watch to make sure everything on the spacecraft performed correctly. It did. “Early on we had no idea whether we’d be able to resolve that issue or not,” Hubble’s deputy mission operations manager, Mike Myslinski, said about the high gyro rates. For now, however, Hubble is back to exploring the universe with three working gyros, thanks to the hard work of a multitude of people on the ground. Learned something new about Pegasus. Thanks for sharing.